Ideal for steps vertical and prominent features. A large and impressive sleeper; heavy and solid. Colour: A dark ‘Kobicha’ brown to almost charcoal. Treatment: Minimal preservation treatment has been applied on these we have been told, but visually not apparent. Mainly due to the density of the timber is one of the highest in the world and hence preservation treatments are unable to penetrate the timber. Description: Four nice and straight square sides with rustic weathering. Noticeably bigger and solid. Smooth in faced texture. Weathered coloring. The underside can have recesses where the tracks plates have been fixed. About: Impressive in stature and colour. Solid and prominent. Using product: A high quality sleeper that will be the ultimate compliment to an existing landscape or prominent design feature in a new build. A passive statement made through the use of hardwood steps, walkways or edging. Will look great will certainly standing the test of time. Interlinks comments / notes: An impressive sleeper. A classic solid, heavy nicely shaded hardwood. Compliments a transition of materials, (Ie concrete to garden) or fantastic for customizing into furniture & living surroundings with a clean weathered look. Facts/ myth debunking: Dense, tight grained, hardwood railway sleepers, especially tropical timbers, are completely different to light, softwood railway sleepers which have to be treated with either creosote or pressure treatment to prevent them rotting and collapsing. 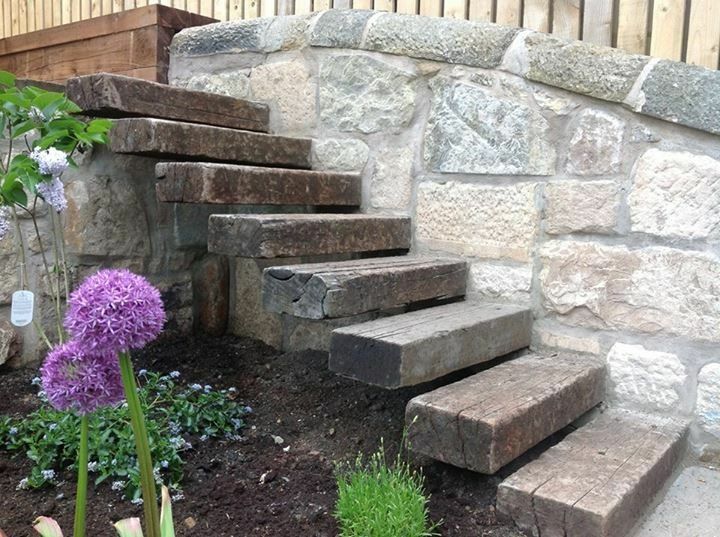 Hardwood railway sleepers are much more durable and naturally longer lasting. —These AA grade sleepers are originally from Africa milled from the beginning of European railway s up until the 1970’s railway sleepers, they have also been used on British Waterways under water, due to their natural preservative qualities. Jarra, Karri, Mora, and Greenheart are likewise placed untreated on the railway track by Network Rail, and are expected to last for up to 100 years. —-So, untreated railway sleepers are popular with those wanting to keep clear of chemical treatments, or contamination, and wanting to use something that is naturally very long lasting. And these AA gardes are the best that can be found in a used and rustic design.